The Credit Crunch of 2008 has exposed the fallacies of neoliberalism and its thesis of the self-regulating market, which has been ascendant in both economic theory and policy over the last 30 years. In moving beyond neoliberalism, social democratic arguments are once again coming to the fore; however, in the context of the 21st century, they will need to be theorized in relation to new global concerns. This book critically revisits the core theses of liberalism and neoliberalism that have provided philosophical support to free market economics - as enunciated in the writings of liberal political philosophers such as Friedrich von Hayek, Karl Popper and Isaiah Berlin - and seeks to expose the deficiencies of their beliefs that became hegemonic from the 1970s until the first decades of the present century. 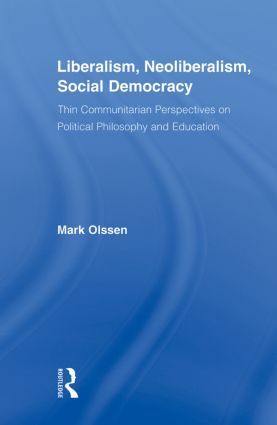 In moving beyond the formulas and mantras of liberalism, the book seeks to re-theorize social democracy and articulate a new vision of the political arrangements needed for the 21st century by reconsidering issues such as liberty, autonomy, social dependence and multiculturalism.